The Natura Organic latex pillow features a 99.99% pure latex core covered with a cushiony soft quilted layer of organic Natura Grow Wool. Naturally antimicrobial, hypoallergenic and breathable, this organic latex pillow has not been treated with chemicals and is ideal for people prone to asthma, allergies or other environmental sensitivities. Designed to regulate skin temperature and repel allergens and bacteria, this luxuriously soft organic pillow will support your head and neck and keep you comfortable throughout the night. 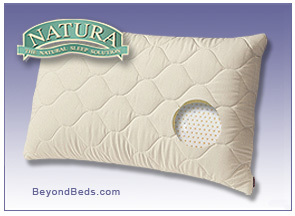 Natura&apos;s Organic latex pillow is covered with an extra-soft organic Pima cotton cover and a plush, quilted, insulating layer of organic Natura Grow Wool that wicks away perspiration and moisture to keep your sleeping environment clean and dry and free of potential allergens. 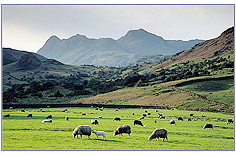 The combination of organic wool, organic cotton and natural latex in the Natura Organic latex pillow create an ideal blend of naturally breathable and hypoallergenic materials that will help to facilitate a deep and restful sleep. The Natura Organic latex pillow will contour to your head and neck to help keep your spine properly aligned and eliminate muscle tension. Constructed of extremely durable and resilient natural latex rubber, the Natura Organic latex pillow will not flatten, clump or separate over time. 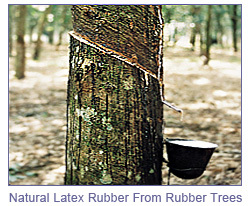 100% natural latex rubber has innate antimicrobial properties that are resistant to the dust mites, mold, mildew and bacteria that can proliferate under damp conditions. 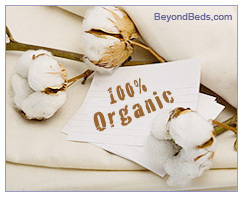 All the health benefits of natural, organic cotton, wool and natural latex are beautifully combined in this high quality, luxuriously comfortable and supportive organic latex pillow.